After hiatus that was long enough to make it seem cancelled, Netflix has announced the season two release date of Marvel’s Jessica Jones TV show. The second season premieres on Thursday, March 8, 2018 at 3:01am ET / 12:01am PT, and all 13 episodes will drop that day. Watch a teaser, below. A dark, superhero drama, Marvel’s Jessica Jones stars Krysten Ritter as the one-time crusader, who is now a New York City private detective. The Netflix TV series also stars Rachael Taylor as Trish Walker; Carrie-Anne Moss as Jeri Hogarth; and Eka Darville as Malcolm Ducasse. Janet McTeer and J.R. Ramirez are joining in the second season. Reportedly, David Tennant will return in season two, even though the Kilgrave storyline was wrapped up in the first season. What do you think? Do you plan to stream the second season of Marvel’s Jessica Jones TV series on Netflix? Which of the Netflix Marvel series is your favorite, so far? Sound off in the comments. 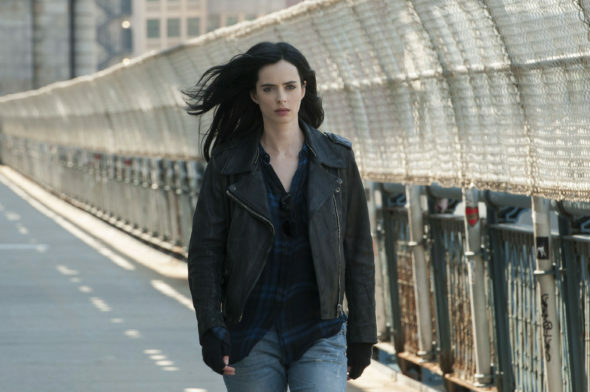 More about: Marvel's Jessica Jones, Marvel's Jessica Jones: canceled or renewed?, Netflix TV shows: canceled or renewed? Marvel’s Jessica Jones: Cancelled or Renewed for Season Three on Netflix?